There are a large number of both bacteria and bacteriophage within a food-processing operation and Biolyse®-PB consists of pure cultures of bacteriophage that are naturally-occurring within potato wash water and provide specific control of the most common soft-rot bacteria of potatoes in the UK. Most recently, we have expanded the bacteriophage coverage to take into account emerging soft-rot pathogens across Europe; bacteriophage have been selected from a number of European potato washing facilities, working closely with industry partners to create a product suitable for use across Europe. The bacteriophage are not modified in any way and make no technological change to the food product. Biolyse®-PB is a ready-to use product available to UK and European potato processors/packers. Its use can be integrated easily into normal potato processing, replacing chemical processing aids such as sodium hypochlorite and incorporated into standard spray-bar equipment. Technical support and efficacy monitoring is supplied by ourselves and if necessary, we will work closely with clients to develop site-specific Biolyse® formulations. Current chemical control of soft rots of potatoes will routinely give a maximum of 1-2 Log reduction; Biolyse®-PB consistently out-performs this, preventing rots and reducing produce rejections. The product is a natural, effective solution to bacterial spoilage, addressing concerns of chlorate residues on foods and reducing the environmental impact of the industry. 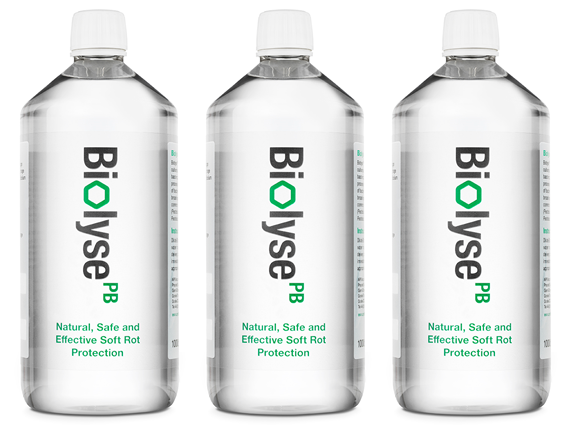 Biolyse®-PB is manufactured to the highest quality and safety standards, presenting no risk to human health. Bacteriophage are the most abundant microorganisms in the environment and are present in significant numbers in water and foods of various origins. They are viruses which infect and kill only bacteria; humans are routinely exposed to bacteriophage at high levels through food and water without adverse effect. Bacteriophage are highly specific (they do not cross species or genus boundaries) and will not affect: (a) beneficial bacteria; (b) commensal bacteria in the gut of humans or animals or (c) environmental bacterial flora. Residue levels, if any, are unintentional, negligible, harmless to humans and other animals and will be removed by washing/cooking. Use of Biolyse® as a Food Processing Aid does not require labelling on the final food products.